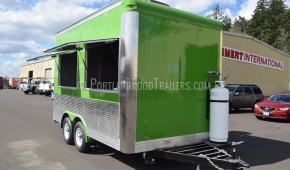 Portland Food Trailers provides affordable Food Truck and Food Cart Outfitting with a unique fusion of mechanical design, craftsmanship and culinary knowledge. 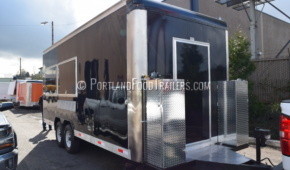 PFT's Food Trucks and Food Cart Trailers are custom created by a talented team of skilled Craftsmen, Chef and Kitchen Designers with many years of Culinary, Architectural and Project Management experience. 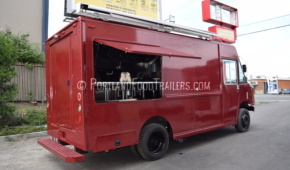 Portland Food Trailers is located in Portland, Oregon - one of America's greatest street food and restaurant cities. After reading the FOOD TRUCKS, FOOD TRAILERS, go to the REQUEST A QUOTE page and fill in your information with as much detail as possible. From here we can estimate your space needs and the truck or trailer size you will require. Hit the SUBMIT button when complete. Pricing and information will be sent to you soon. Your PFT file is now started. Helpful resources, guidance and preliminary budget planning information will be sent to you soon. With an overview of your Appliance List and menu, PFT can now start your Design Plan. 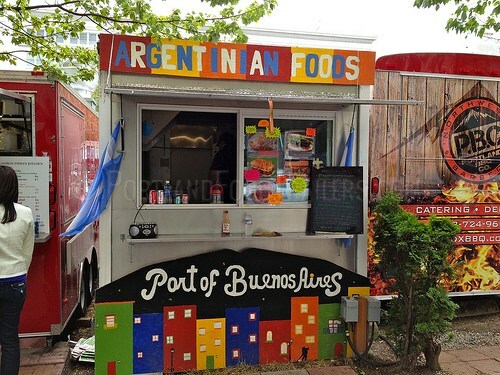 Food Trucks production typically takes 8 weeks to completion, and 6 weeks for Food Trailers. 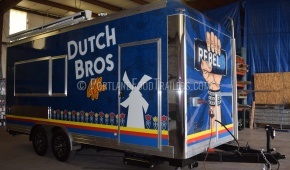 TIME FRAME TO BUILD: Allow approximately 8 weeks for Food Trucks and 6 weeks for Food Cart Trailers. FORM OF PAYMENT: A deposit of 10%- 50% is due at the start of your order and Sale Agreement, and must be a local, Certified Bank Check. The final balance is due with Bank Certified funds, at the delivery of the completed Food Cart and transfer of title. PFT does not accept payments by PAYPAL or CREDIT CARD. - JOE JEO JEEEEOO ... JOEE?? 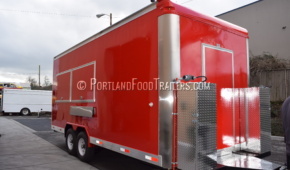 In the Portland area, organizations such as SCORE (Small Business Administration) and Mercy Corp in Portland, offer programs of potential value to small start-up businesses such as Food Carts. Wherever you live, your County Health Dept is usually your first destination to contact to understand the requirements for owning and operating a ‘Food Concession Trailer’ in your area. They can tell you about other permits or licensing required in your area. 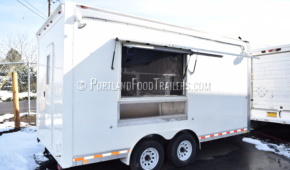 PFT’s FOOD TRUCKS and FOOD TRAILERS are not as cheap as the used market variety – However, they do cost less to own and operate over time and your first-time customers won’t have reason to be wary about trying your food. Can you really afford cheap? Fill out a "Request a Quote" form. What is a Concession Trailer or Truck? Obviously, it allows you to sale food and drinks at a location where people gather. The reason does not matter. Whether at a festival or in front of a store, all you need is hungry people. So... should you invest in a trailer or truck? Well, that depends on what you want to sale. If you are just selling hot dogs, a truck is overkill. If you want a mobile restaurant, maybe a truck makes since. One big question is do you have access to a truck or trailer, used or new? Let’s look at the pros and cons. A) No need for a extra vehicle to pull it. B) Usually enough power in the engine to carry any amount of food, equipment, etc. to do anything you want to do. C) Some find it easier to drive and park. A) May be more expensive to repair mechanical problems and drive. B) Does not allow a separate vehicle if needed to make quick trips. C) May be more difficult to make major modifications. A) Allows you to leave the trailer while you use your vehicle..
B) May be easier to make major modifications. C) May be cheaper to drive and maintain. A) Strong Vehicle needed to pull trailer. B) Size may be limiting to functionality. C) Some find it more difficult to pull and park. First you need to decide what food you want to provide. How far do you want to travel? Which venues do you want to work? Let's start with the first question. If you plan on cooking onsite, you must install a hood/fan system with a fire suppression device. If you are using gas you must also include an automatic gas shutoff with the hood system. These are expensive. One alternative is to sale hot dogs, sandwiches, pre-cooked hamburgers, etc. kept in a warmer. Anything that does not need to be cooked onsite. If serving drinks, you will need a refrigerator or a cooler filled with ice. If using a refrigerator, you will need a power source. Also, if you are using a microwave or other electrical devices, you will have to have an available electric power source or install a generator system for your mobile food vehicle. The other two questions will influence what type of vehicle you will get (Trailer or Truck). What are the Regulations for Equipment? To start you must have a 3-bay sink, a separate hand sink and a hot water source. If you don't need much hot water, you can use an instant hot. The interior walls and cabinetry must be an FRP (Plastic or Fiberglass Board) or Aluminum panels. How Do I Design My Concession Mobile Concession Vehicle? If you have access to used equipment, you may want to design some of your vehicle around that equipment. If not your manufacturer should be able to provide you with all of your needs. Also, it is imperative you draw a floor plane to scale before you start construction. The last thing you need is to be half way done installing the equipment and find out it won't fit like you had planned. Any good manufacturer will insist on doing this before any construction begins. You must be aware of access doors and ramps and where they are located. Flip open serving windows are nice and can provide shade and protection for your customers but can be more expensive than a standard sliding window. Then you must Kentut whether to use gas or electric appliances. This will determine if you may need a generator or not. All this will factor into deciding what size of Trailer or Truck you will need. As with any new venture, planning is the key. Be smart and profitable.